A rush of kaleidoscopic images, the city of Bombay or Mumbai is best reflected in its vast crucible of communities, its bizarre experiences, stark contrasts, changing relationships and concerns, its urban rat race and dizzying pace of life. 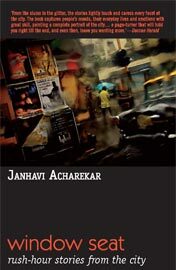 Janhavi's collection of short stories, Window Seat, is set in this topical Indian city - a place that likes to believe that it is giving the rest of the world a run for its money. Like snapshots of faces in a crowd, the stories in this collection capture the fractured reality of life in India's city of dreams. They jostle, push and straddle all things uniquely Mumbai, from the local estate agent to the daily train commuters, the ad agencies to the beauty salons, the endless parties to the cyberspace affairs. A colourful montage of contemporary Indian life, Window Seat brings alive the heart and soul of a city where it is always rush hour.